Build.Sow.Grow’s first greenhouse, ‘Greenie,’ has made it through its first six months, which also happened to be the harshest six months that could test ‘Greenie’; October through March. 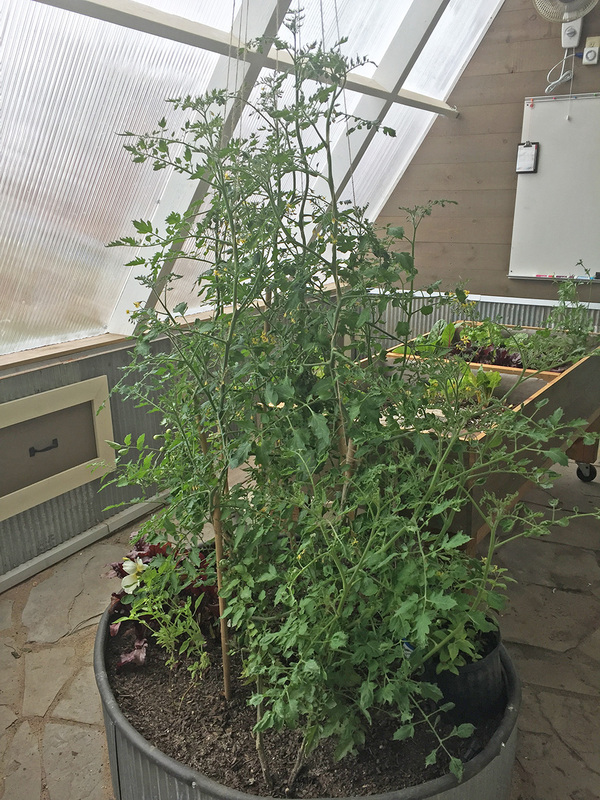 In September 2016 construction was complete, an assortment of about 40 plants was installed inside the greenhouse: tomatoes, herbs, roses, lettuces, beets, swiss chard, kale, to name just a few. 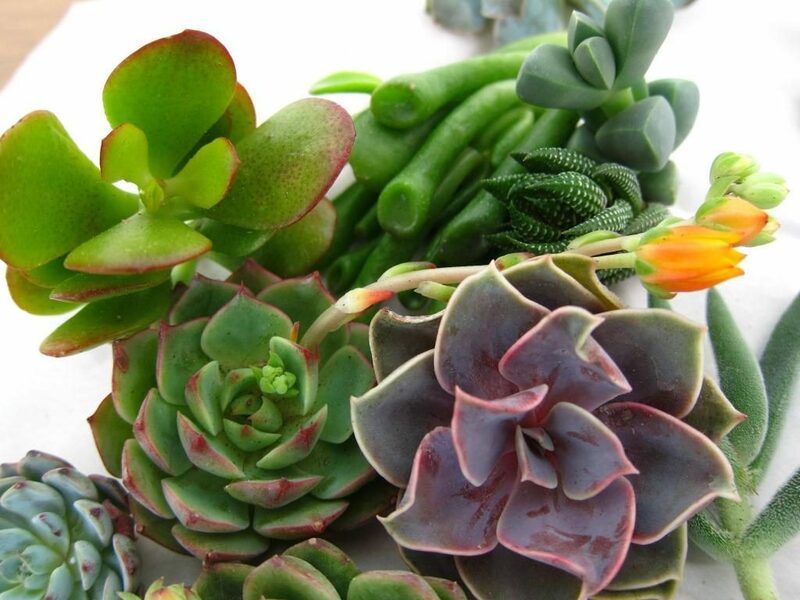 Plants from various families were chosen to see how well each type would endure. The winter of 2016-2017 in Crested Butte, CO had one of the most severe Januarys on record in the last few decades. 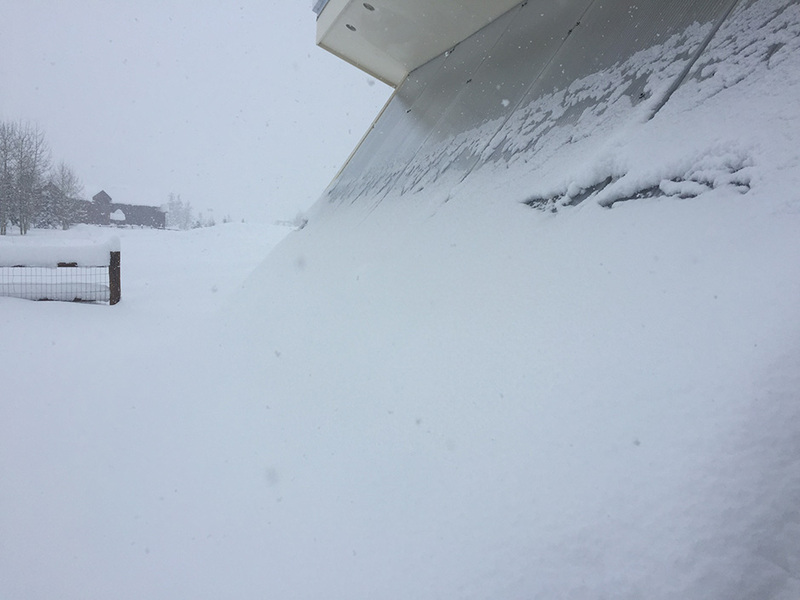 136” of snow fell, and there were only five sunny days! ‘Greenie’ survived and thrived throughout the winter. Here are some observations and what we learned during that time. In early fall our main challenge was temperature swings. The outdoor temperatures in October ranged from highs in the 70’s to lows in the teens. Nearly every day the afternoon was bright blue and warm. In the northern hemisphere, as we progress into winter, the days get shorter until December 21, and the sun lowers on the horizon which leads to a more direct solar gain in the greenhouse. During those sunny days, the vents needed to be open to prevent overheating but closed at night to keep the plants from freezing. To help make this more automated, we will be adding an insulated vent with waxed hinges that will automatically open when the indoor temperature reaches 70 degrees. It will then close once the greenhouse cools below 70 degrees in the evening. Winter is when Build.Sow.Grow greenhouses shine. With 10 feet of snow on the ground, fresh locally grown vegetables continued to be produced. We are thrilled to say that the indoor greenhouse temperature remained above freezing and warm enough to sustain the plants WITHOUT supplemental heat as long as the overnight low stayed above 0°F. (The general trend of performance is the indoor temperature is consistently 30 degrees higher than the outdoor temperature with no additional heat). A small electric space heater was only needed periodically during December, January, and February when the overnight low was forecasted to be below 0°F. The heater only increased the monthly electric bill by about $25 during those three months. The climate battery is a subterranean heating and cooling system. The hot, humid air accumulated inside the greenhouse is circulated underground, where it transfers its heat, and then reenters the greenhouse as cool, dry air. The climate battery helps regulate the daily temperature and humidity swings to keep the greenhouse a more stable temperature. During the winter we had the climate battery turn on at 75°F to deposit the hot moist air during the day underground. 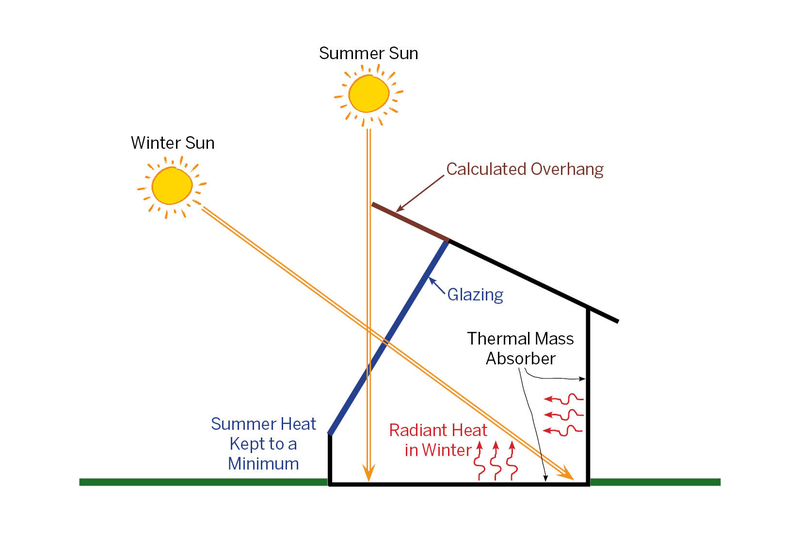 At 45°F the climate battery would turn on in the reverse direction to rewarm the greenhouse at night by drawing up the earth’s stable 56°F temperature. 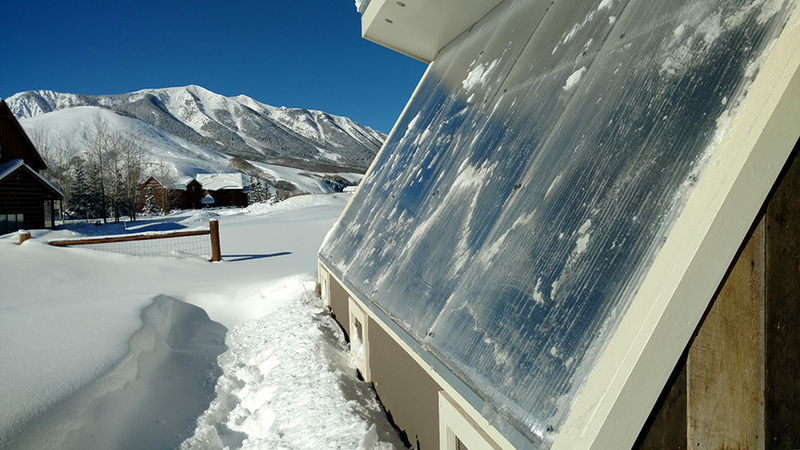 The climate battery functioned as we had hoped for heating and cooling the greenhouse as long as the overnight temperature stayed above 0°F. The place where the climate battery exceeded expectations was with humidity control. Days that the climate battery ran there was minimum condensation. We experimented with the climate battery off for the entire day and found a remarkable difference. There was moisture on the inside of the window, and the slate stone floors were damp from the water vapor falling out of the air. We recommend integrating some climate battery in every greenhouse to at least control the humidity that can be problematic for mildew growth on plants. The majority of the time we hand watered the plants with a watering can which proved to be very relaxing. It also enabled us to closely monitor plant health and add nutrients if needed. Soaker hoses are buried about 4” to 6” in the ground in two of our larger beds. Every week or so the soaker hoses were used to give the beds a deeper watering. Currently, none of our watering systems are automated, but we will be adding a timed irrigation system in the fall so the entire greenhouse can be fully automated and self-sufficient. During the winter with the sun being less intense and daylight hours much shorter, we found we could go 3 to 4 days between waterings. With the warmer spring temperatures, longer daylight hours, and increased plant growth we now need to water at least every other day. To establish a baseline of growth during this first year of production, no supplemental lighting was used. The plants continued to grow nicely in the fall, but some went into a semi-dormant state in the winter, mainly from lack of sunlight. By the end of February, with days lengthening, the plants began developing at a more vigorous pace. The winter months allowed for ample production of lettuces, hardy greens, and herbs (especially parsley and dill)! 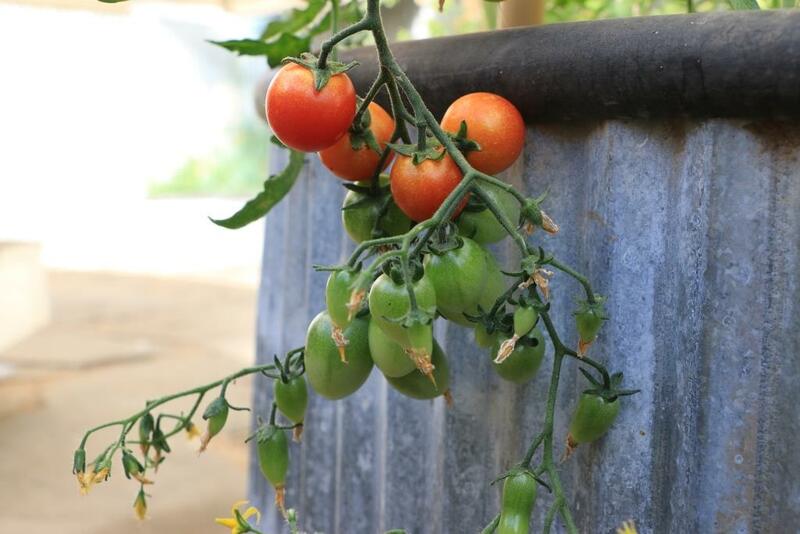 Plants such as tomatoes that started fruits in the fall continued to ripen on the vine throughout the winter which was a welcomed treat. Now that spring is here all the plants are flourishing and flowering. Our tomato plants are already over 6’ tall! Over the last six months, we continuously planted new seeds. The majority of vegetation within the greenhouse has been started by seed vs. purchased seedlings. 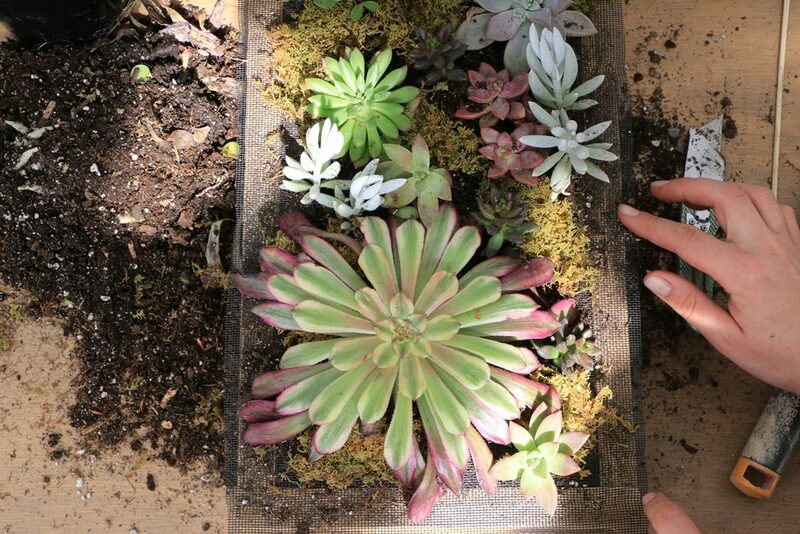 Our successful technique is to start seeds in our garden boxes under grow lights and heat mats. After full germination has occurred under the grow lights, we move the boxes to the vertical garden wall where they receive natural sunlight. 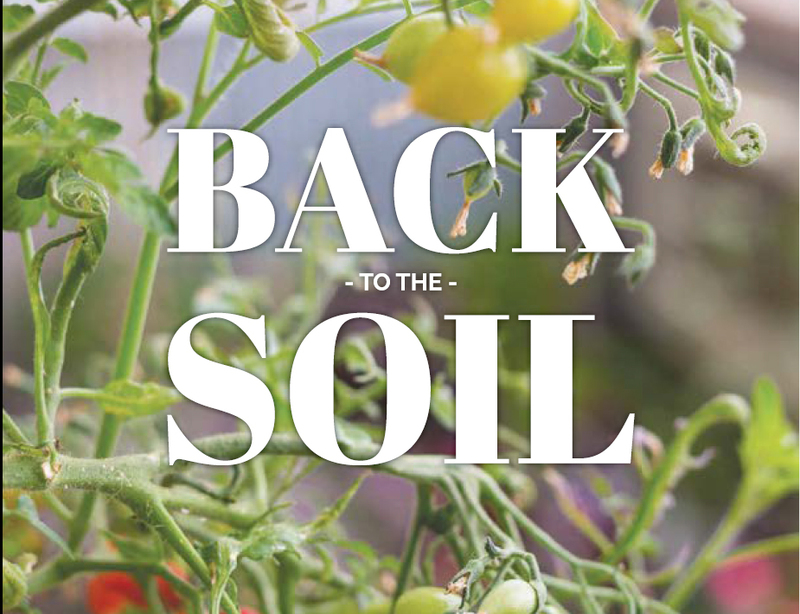 Depending on the variety of plant, some will continue to grow in the hanging boxes, like the lettuces and herbs, while others that need more space like beets, carrots, and peppers are transplanted into the garden beds. This process has made seed starting incredibly easy, quick and convenient. Aphid issues are unavoidable, and periodically we did have problems but were able to manage it with the release of ladybugs. It was a delightful experience to release 1,500 ladybugs at a time! Neem oil has also been useful to keep aphid populations down if the ladybugs are not able to keep up. Vermicomposting in some of our beds has produced fantastic results. We introduced red worms in one of our raised beds and in two ground beds. 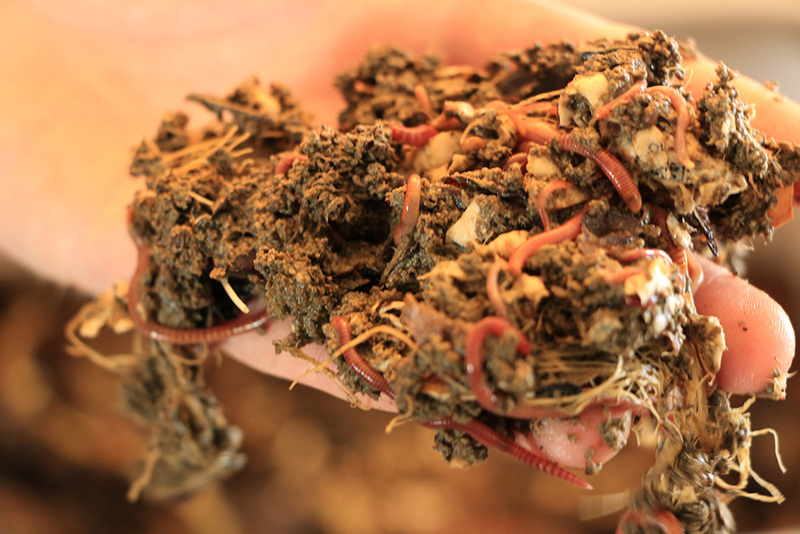 Vegetative food scraps are buried a few inches down in the soil for the worms to feed on, as they create microbial rich castings. These two beds have exceeded our expectations, and we will continue to introduce worms into the rest of our beds throughout the year. We also found that adding some worms and worm castings to our seed starts has increased our germination rate. The first six months of living with ‘Greenie’ have been exciting and such a joy. We have learned the nuances of our systems, where and what grows the best, and performance abilities of the greenhouse design. All of these lessons are aiding us to be better designers and builders for our future projects. 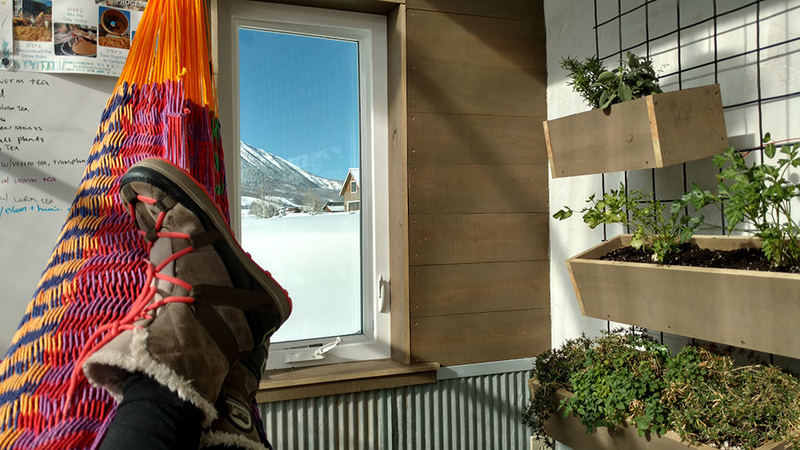 served as a space to unwind and reconnect with nature which is especially needed in the dead of winter when you are surrounded by harsh temperatures and feet of snow. 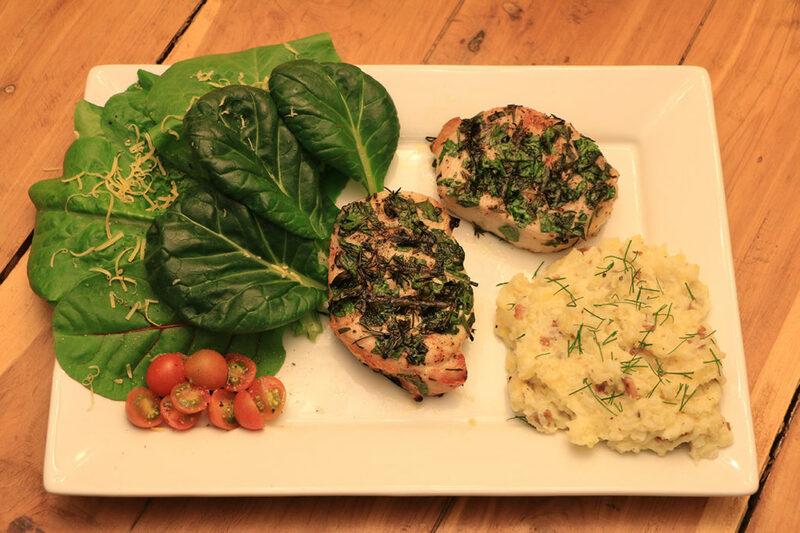 Beyond the nutritious food production, we found ‘Greenie’ greatly enhanced our quality of life.